Wendy Jane’s Weekend Sounds: Prince + Added Bonus: What’s In Prince’s Fridge? In difficult times we look for the truth. It’s been a hard week, with losses universal and personal. To me, and I know, so many others, Prince is the truth. He is a master musician who writes songs that speak to all the thirsty parts of us that seek wisdom, love, acknowledgement, and, yes, sensuality. During times like this, we also seek comfort, and I was delighted to receive the link from my friend Stephanie to Heavy Table’s (a Minneapolis based blog on food culture) inaugural article of the series, What’s In Your Fridge? 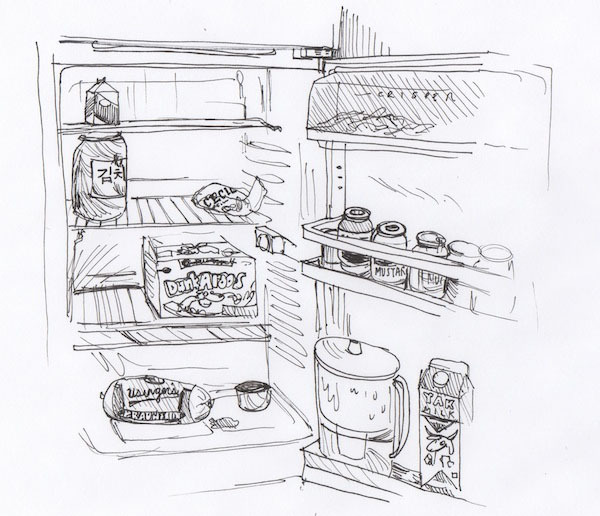 The series looks inside celebrities’ refrigerators at one given moment, and Prince was the first to be featured. See what comfort food Prince likes to keep on hand, and what he says about it. Then let me know what your throwback comfort food is. A few of mine are Milky Way bars, hot tamales candy, and I know this probably sounds gross, but my Dad shared this with me–spaghetti with butter and ketchup and black pepper. That one does it every time; instant childhood comfort. I hope you all are finding comfort this weekend in whatever form suits you. yes to that,especially in this heatwave!